If you’ve arrived in Auckland for a long weekend and fancy getting out of the City for a day then a trip North across the Harbour Bridge could be just what the doctor ordered. Auckland is blessed with a wide variety of regional parks on its doorstep and we have pulled together some info on our favourite three. About a 20 minute drive out of the City you will find Long Bay Regional Park. Well signposted from SH1, the park is teaming with things to do from cliff top walks to a great adventure park for the kids. With ample free parking, some awesome BBQ areas and enough green space to accommodate 100 backyard cricket games Long Bay Regional Park is a great way to spend some time and get away from the hustle and bustle of City life. As you might imagine from the name, Long Bay Regional Park takes its name from the bay in which it sits. With calm shallow waters, this is the perfect place to take a dip, head out in a kayak or try your hand at paddle boarding. The beach here is pretty narrow but it stretches out around the bay leaving plenty of room for sunbathers and Frisbee throwers alike. If you’re feeling more active, you can take the coastal track north towards the Whangaparaoa Peninsula ending up at Okura River – a good 6km hike up and down into bays along the way which will take you around 3 hours. With Browns Bay a stone’s throw away you can always head down there for a spot of lunch and an afternoon drink in the sun or better still, pack up a picnic and make a full day of it in the park. Located 50 minutes’ drive from Auckland is the stunning Shakespear Regional Park. Found at the tip of the Whangaparaoa Peninsula, this park offers stunning views back towards the City and Rangitoto and is New Zealand’s most visited open sanctuary. The park is home to a number of walking tracks and is a great way to spend a few hours, taking in the fantastic views to the North and South of the peninsula. From the lookout track which will take you to the highest point in the park where the lookout tower will give you 360 degree views of the City to the Tiri Tiri track which will take you to the furthest point East on the peninsula, the walks are challenging but rewarding. Mountain bikers are also welcome on the tracks which are hilly in parts. 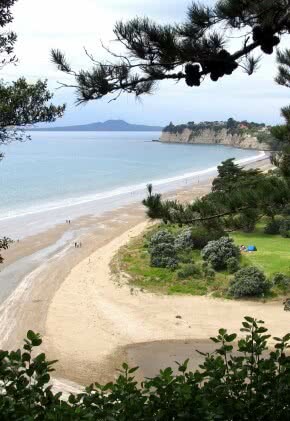 Away from the walking, the beautiful Te Haruhi Bay is a great place to go for a swim and relax on the golden sands. The park also has plenty of green space to spread out, pitch a gazebo and relax with family and friends. The trees provide great shelter from the midday sun and the BBQ areas are popular on the weekend. With some amazing bird watching, diving opportunities, fishing and kayaking, Shakespear is a great place to spend the day whether it’s chilling out or getting stuck in. If you fancy making a longer stay up on the peninsula, the Te Haruhi camp ground located within the park is a great place to pitch up and relax for a few days. Whangaparaoa town is only 10 minutes’ drive away so you can stock up on supplies and enjoy a few relaxing days in the park. The last of our favourite three regional parks is Wenderholm. Located about 5 minutes’ drive beyond the town of Orewa, Wenderholm Regional Park is a hidden gem that few people south of Orewa know about. Located at the mouth of the Puhoi River and surrounded by forested headlands, Wenderholm is considered one of the most beautiful regional parks. As with the other two parks, there is plenty to do in Wenderholm whether you’re into walking, swimming or simply relaxing on the beach. There are a number of forested tracks from the 4km Perimeter Track to the 1km Te Akeake Walk. The views from the Perimeter Track are well worth the hike though with stunning views out into the Hauraki Gulf. If walking is not your thing, a kayak up the tranquil Puhoi River is a great way to spend a few hours relaxing but be careful not to get stranded on the mud flats close to low tide! A great option if you have a few days up here is to book one of the bachs located in the park and really relax and unwind in this little corner of paradise. Whether you live in the city or you have just arrived in Auckland, the Regional Parks are definitely something to add to your To Do list. You can find out more information about all the Regional Parks in and around Auckland on the Auckland Council website. Bush and Beach is Auckland’s premier small group day tour and sightseeing company. Discover the delights of Auckland city, Auckland’s Waitakere Ranges rainforest and black sand beaches, food and wine tours and even a tour through Middle Earth to the Hobbiton Movie Set.